I am blessed to be one of five girls in my family. In fact, I have only sisters! With Mom and all those other girls in the house my Dad actually used a bathroom that was in the basement. He even built himself a nice little shower down there. I have fond (and of course sibling rivalry) memories of growing up with my sisters. In our later years I am now blessed to have several brothers by marriage as well. 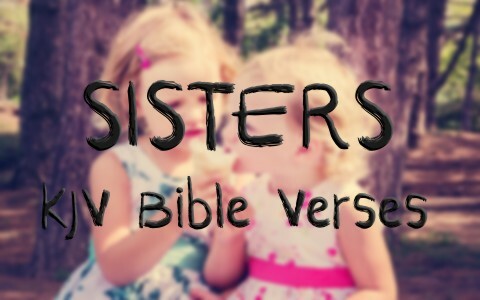 As I was looking through the Bible I have found these to be my favorite and memorable KJV Bible verses about sisters. Leviticus 18:9–13 The nakedness of thy sister, the daughter of thy father, or daughter of thy mother, whether she be born at home, or born abroad, even their nakedness thou shalt not uncover. The nakedness of thy son’s daughter, or of thy daughter’s daughter, even their nakedness thou shalt not uncover: for theirs is thine own nakedness. The nakedness of thy father’s wife’s daughter, begotten of thy father, she is thy sister, thou shalt not uncover her nakedness. Thou shalt not uncover the nakedness of thy father’s sister: she is thy father’s near kinswoman. Thou shalt not uncover the nakedness of thy mother’s sister: for she is thy mother’s near kinswoman. Romans 16:1-2 I commend unto you Phebe our sister, which is a servant of the church which is at Cenchrea: That ye receive her in the Lord, as becometh saints, and that ye assist her in whatsoever business she hath need of you: for she hath been a succourer of many, and of myself also. I Timothy 5:1-2 Rebuke not an elder, but intreat him as a father; and the younger men as brethren; The elder women as mothers; the younger as sisters, with all purity. James 2:15–17 If a brother or sister be naked, and destitute of daily food, And one of you say unto them, Depart in peace, be ye warmed and filled; notwithstanding ye give them not those things which are needful to the body; what doth it profit? Even so faith, if it hath not works, is dead, being alone. 2 Kings 11:2 But Jehosheba, the daughter of king JORAM, sister of Ahaziah, took Joash the son of Ahaziah, and stole him from among the king’s sons which were slain; and they hid him, even him and his nurse, in the bedchamber from Athaliah, so that he was not slain. 1 Chronicles 2:15–16 Ozem the sixth, David the seventh: Whose sisters were ZERUIAH, and ABIGAIL. And the sons of Zeruiah; Abishai, and Joab, and Asahel, three. 1 Chronicles 6:3 And the children of Amram; Aaron, and Moses, and MIRIAM. The sons also of Aaron; Nadab, and Abihu, Eleazar, and Ithamar. Luke 10:38–39 Now it came to pass, as they went, that he entered into a certain village: and a certain woman named MARTHA received him into her house. And she had a sister called MARY, which also sat at Jesus’ feet, and heard his word. The Bible is just full of sisters, I have only included a few verses here. Can you find some more sisters? The love and companionship of a sister is a very special thing. I pray that you were blessed by these verses. Related reading for you: How Does God Define Family? Previous post: Where Does The Bible Mention The Rapture? Next post: Should You Force Your Teenager To Go To Church?